A functional and comfortable Y-harness for everyday use and training. The durable harness comes with adjustable neckline and chest, which ensure that the harness fits well. A soft neoprene-padded belly part to improve the harness’ wear comfort. The harness is designed to distribute the pressure equally across the chest. 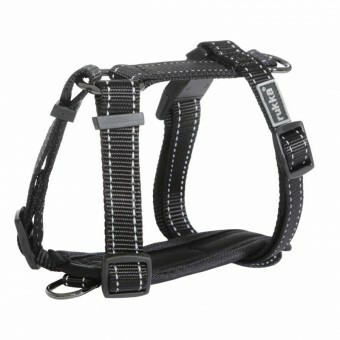 Thanks to the quick buckle closure with a safety lock, the harness is easy to put on. The leash can be attached either to the back of the dog or below its chest. The machine-washable harness dries fast and is easy to keep clean. The harness has reflective stitching and logo.